Memorial Day morning I woke up early — way too early! So, since I had a new iPhone 5 and I wanted to try out the camera, I woke up the hubby and said, “Let’s go for a walk!” He thought I was either kidding or meant let’s go later. Nope, I wanted to walk down to the lake to catch the sunrise. And, after checking, I learned that sunrise was scheduled for 6:28 a.m.! No time to dilly-dally. I think I’m going to have fun with this camera phone. I just think it’s too bad I didn’t read the camera instructions BEFORE I went to the lake. I would have known I could zoom in on stuff. Oh, well, this could be the start of something new! The pictures have no touching up done to them. On with the show! 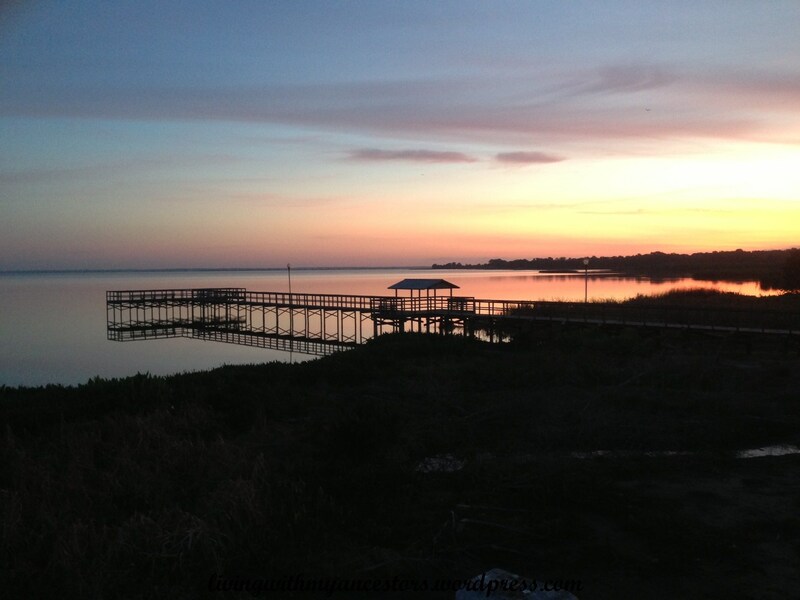 Lake Apopka is probably about 4-5 blocks from our house. 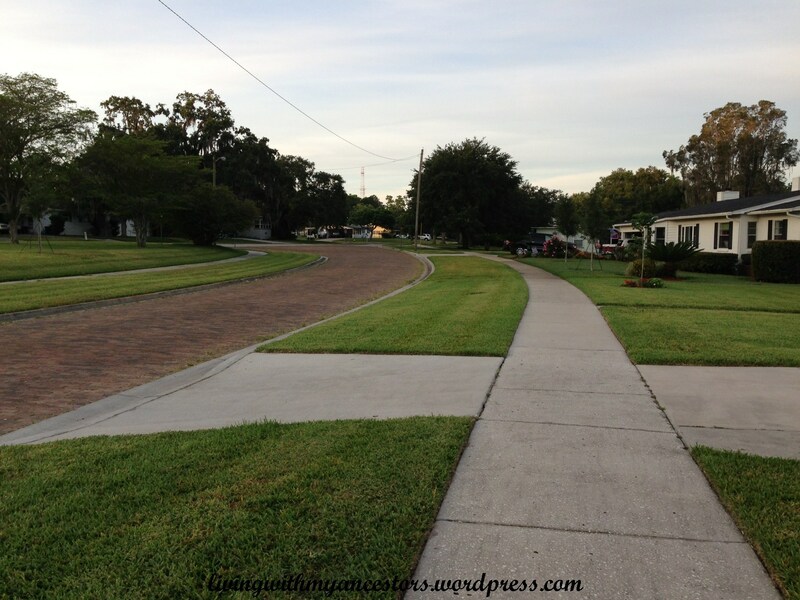 We left on our walk about 6:00 a.m. It took us about 15-20 minutes to walk there. 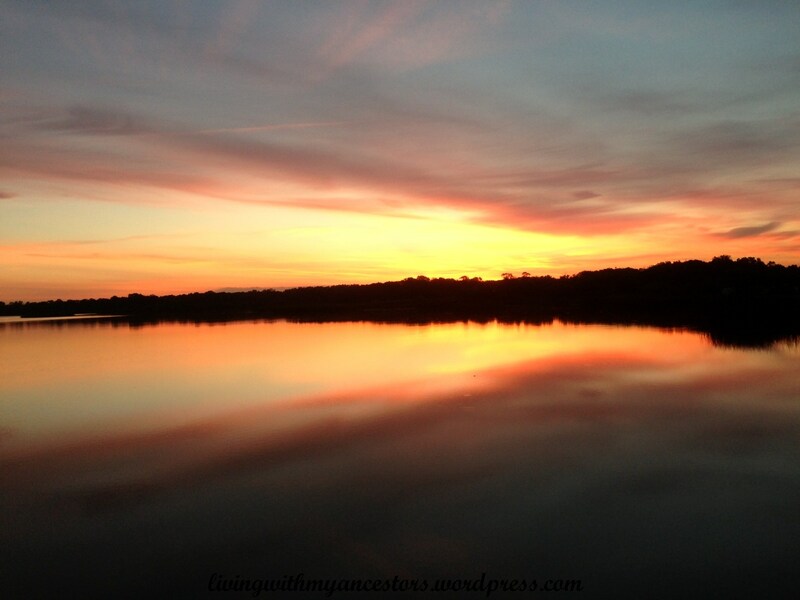 While we were waiting for the sun to peek over in the east, I turned around to face the west. The moon was still there as big as life itself. Moonshine! Well, you know what I mean…! 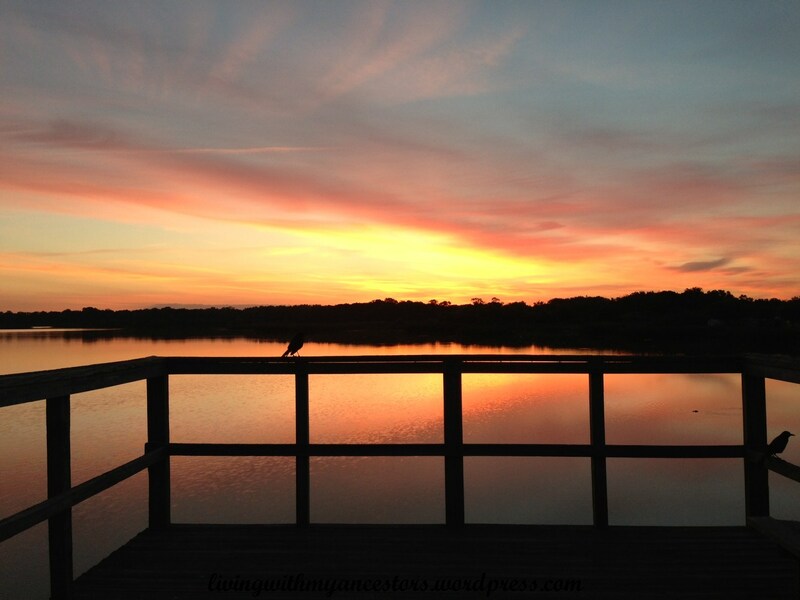 While we were waiting for the sun to keep rising, we saw turtles, big gators and a couple of baby gators, all kinds of birds, little ones and big ones. They wouldn’t show up in my pictures because they were always too far away. And, of course, I didn’t know I had a zoom lens. Although, if you look very closely in the right-hand square below, there’s a spot in the picture. Yep, it’s a gator swimming away from us. Oh, look, birds! You can almost see them. Where’s that darn zoom? The fishing was amazing. We saw so many of the osprey diving and flying off with their breakfast of fish. They moved so fast I was never able to get one on camera. Okay, it’s up, we can go now! Such a pleasant and perfect morning. The temperature was perfect. It was probably 60’s and just ever so slightly breezy. The heat and humidity had not come into play as yet. Once the sun was up and over the horizon, we started for home. Breakfast was waiting to be made! Well, I have to admit here that I just don’t know the names of flowers and plants unless it’s the obvious (roses, tulips, daisies, etc.). 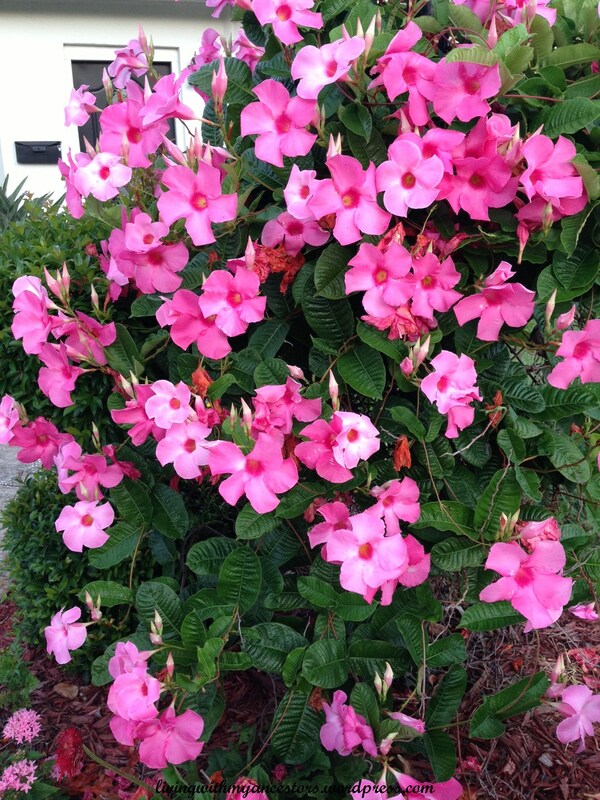 I think these are azaleas and, boy, this bush was just beautiful. It’s wrapped around a light in a front yard. I didn’t take a picture from afar. I wanted one that just showed all the flowers and their color. This house below is around the corner from us. I just love this house. I think it was probably built in the 20’s or 30’s. I can’t begin to count the number of commercials and movie scenes that have been filmed using this house as a backdrop. It’s kind of hard to actually see the houses itself through the trees. 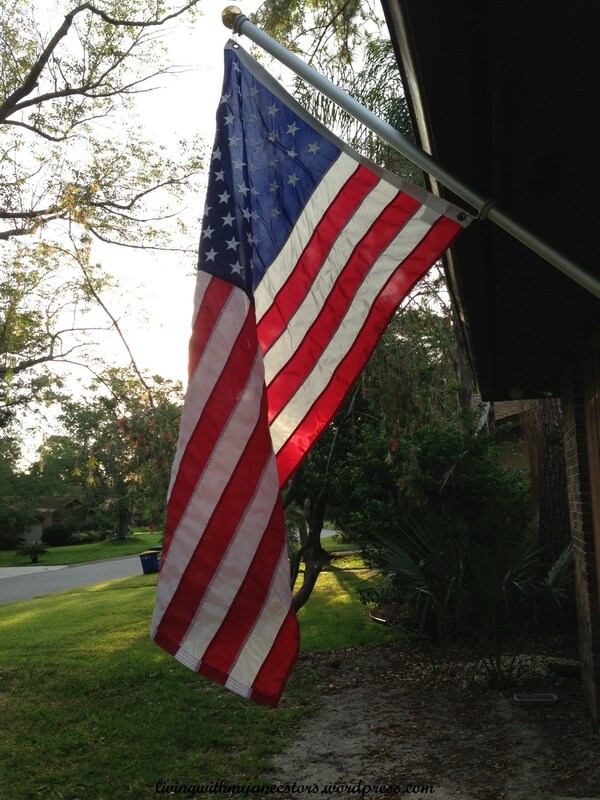 I just want to pay homage this Memorial Day weekend to all of the men and women, past, present and future, wherever and however they have sacrificed or will sacrifice in giving service to this great country and the freedoms I enjoy. God Bless each and every one of you and your families. The true meaning of Memorial Day. 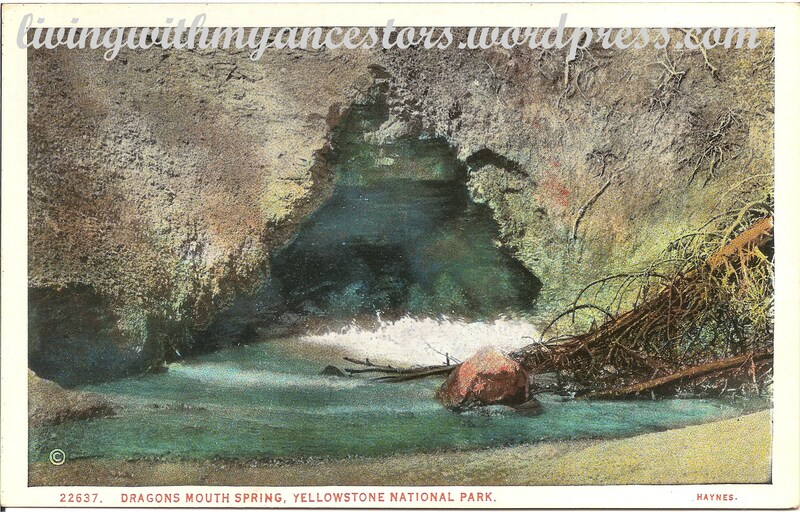 Yellowstone National Park 1931-32 – Continued! 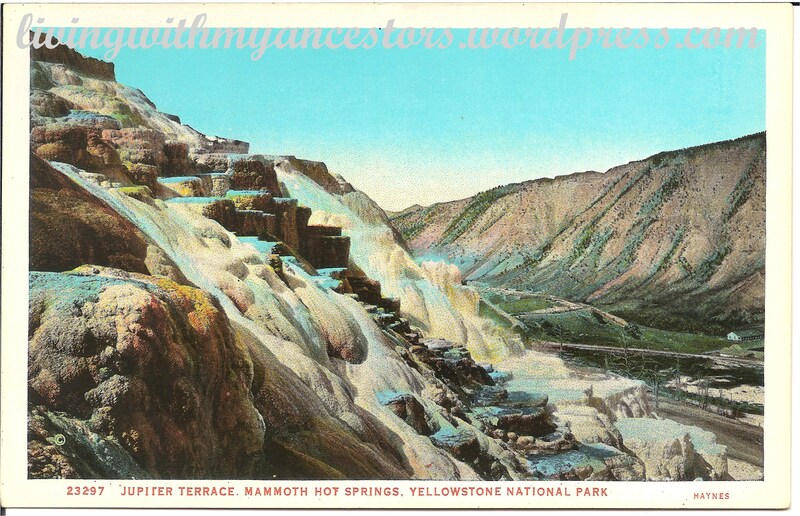 Continuing with my Dad’s west coast adventures, I have more old postcards from Yellowstone. He was good at buying postcards and actually writing messages on them, addressing them, and then not sending them! All of the postcards in my possession contain no stamp or postal cancellation. So, I must assume that he just brought the cards back to Kentucky when he returned. I do hope he did manage to send other cards to all these people. After all, he was asking them to write! If you’re just joining us here, please feel free to visit the three posts leading up to this one. For the beginning of the story, click here to open Riding the Rails During the Great Depression, click here to open Dad’s Tour of the West Coast During the Great Depression, and click here to open Yellowstone National Park 1931-32. Each link will open in a new tab. It seems he stayed out West a lot longer than I ever thought. He and his friends arrived in Oregon in April 1931 during the Depression. I now believe they went West seeking better employment opportunities. After some touring and spending time with friends in Santa Barbara, he got employment that summer at Yellowstone National Park. 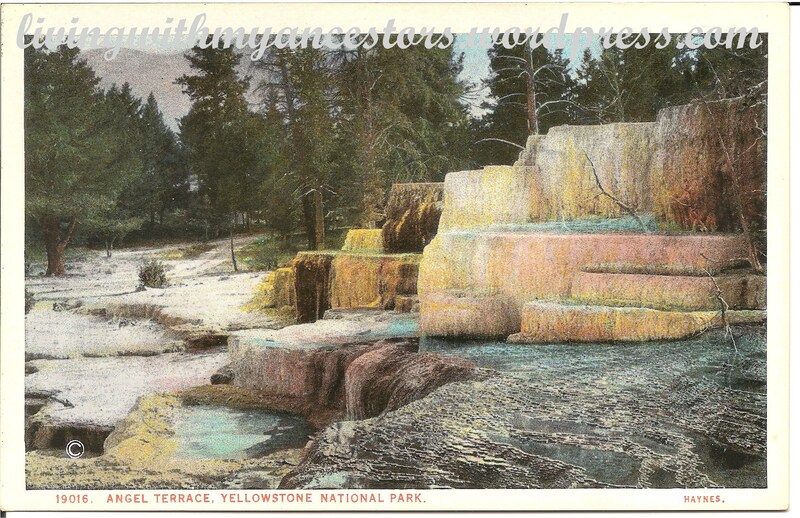 He indicated on some of the cards that he would be in Yellowstone until September/October and then would return to Santa Barbara (or the California coast) for the winter. He never talked much about it to me when I was growing up. Oh, the opportunities we miss to learn about our family and heritage. Anyway, about the only thing I ever remember him saying is that one should never want to cross the path of the grizzly bear. 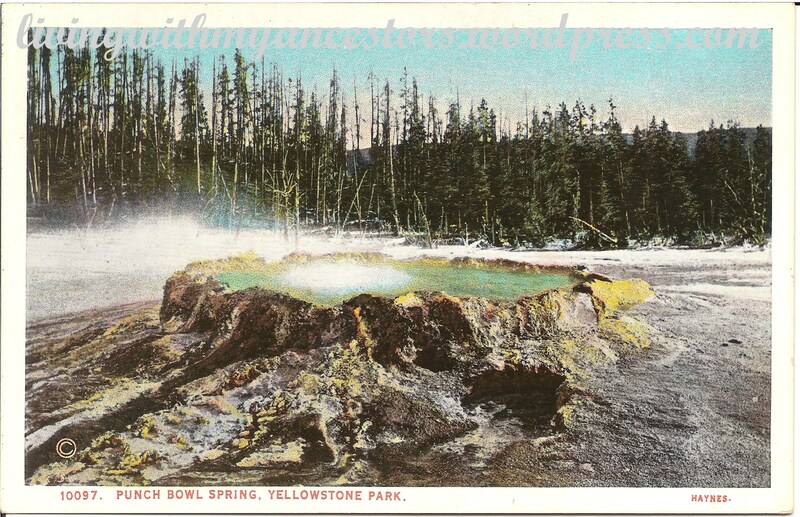 Punch Bowl Spring, Upper Geyser Basin, Yellowstone Park is a good example of the built-up-rim type of hot springs. The Punch Bowl is always turbulent but never erupts, and its water is very hot. Today: This boiling, intermittent spring has produced a sinter lip that raises it above the basin floor. That “punch bowl” appearance gave this feature its name. 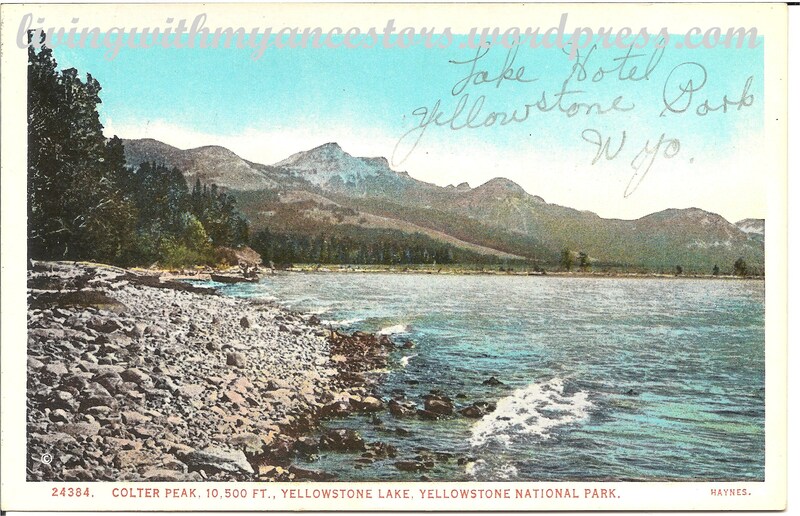 Colter Peak, Yellowstone Lake, was named for John Colter, the first white man ever to visit the region. In his wanderings of 1807, he discovered the park after leaving the famous Lewis and Clark expedition on its return trip. Today: Elevation 10,640 feet (3,240 m) is a mountain peak in the Absaroka Range in the southeastern section of Yellowstone National Park. The peak is named for mountain man John Colter, reputedly the first white man to visit the Yellowstone region. Colter Peak was first ascended in 1870 by Lt. Gustavus Cheyney Doane and Nathaniel P. Langford during the Washburn-Langford-Doane Expedition. Henry D. Washburn, the expedition leader named the peak for Langford and Doane. Angel Terrace, Mammoth, Yellowstone Park, is near the road and is generally admired. It was first called Haynes Spring, for F. J. Haynes, but at his request the name was changed in the late 1880’s to Angel Terrace. Today: Known both for the pure white formations and colorful microorganisms of its active periods, Angel Terrace is one of the area’s most unpredictable features. For decades it was dry and crumbling. More recently, hot springs have been intermittently active in parts of the formation. The travertine (calcium carbonate) terraces at Mammoth Hot Springs are formed by the overflowing limeladen hot water. Four factors are held responsible for this: the cooling of the water, evaporation, the giving off of the carbonic acid gas dissolved in it, and the absorption of lime by the algae — a low form of plant life. Today: Jupiter Terrace displays cycles of activity. In the 1980s Jupiter Terrace flowed so heavily that it overtook boardwalks several times. It has been dry since 1992, but when active, its color and intricate terraces make Jupiter an appealing spring. 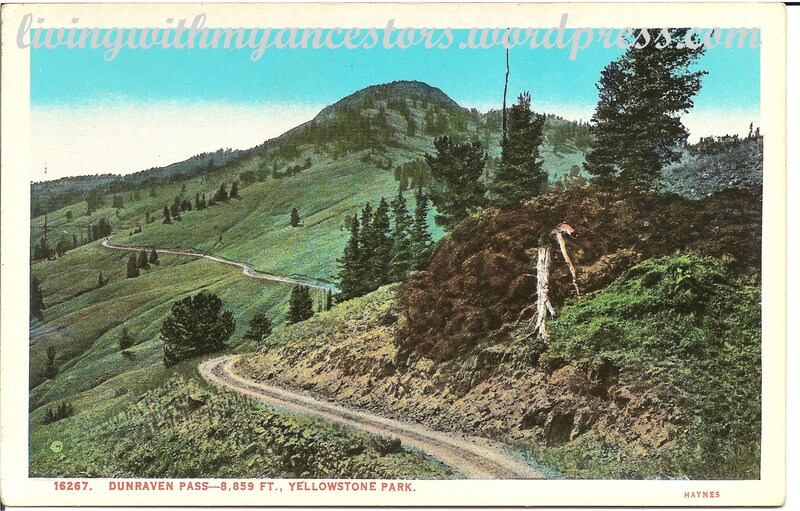 Dunraven Pass, 8859 Ft., Yellowstone Park, was named for the late Earl of Dunraven, who made some memorable trips in the region in the early days, and published an interesting book about the park. It is on the side of Mt. Washburn between that mountain and Dunraven Peak. Today: Dunraven Pass is the highest road pass in Yellowstone National Park, and because of this, it can get snow at any time of year– even summer. It’s always the first to close during a regional snow storm, and it is always the first road to close in the fall as Yellowstone Park winds down for the winter. The beautiful Dragons Mouth Spring of hot, clear water contrasts with its near neighbor the Mud Volcano which belches boiling mud. 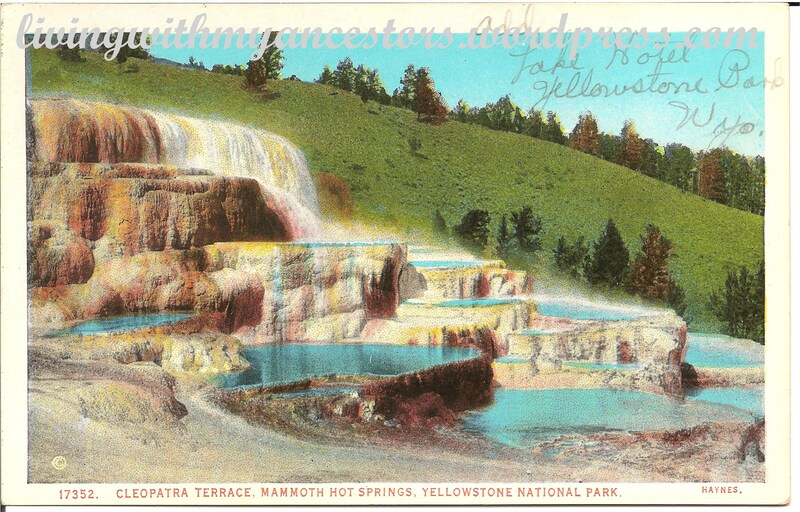 These are two contrasting types of thermal springs of which Yellowstone has many. Today: Temperature 170.2°F Dimensions 18×30 feet. Depth 16 feet. Dragon’s Mouth is a turbulent hot spring with a cavernous mouth. Water sloshes rhythmically in and out of the cavern giving the impression of a large overflow; however, the actual discharge is quite small. Much of the activity and energy is located within the cavern. As hot water rises to the surface, hydrogen sulfide, carbon dioxide, and water vapor gases expand creating a pressure explosion in the cavern. The resulting activity is sloshing, belching, and steaming. 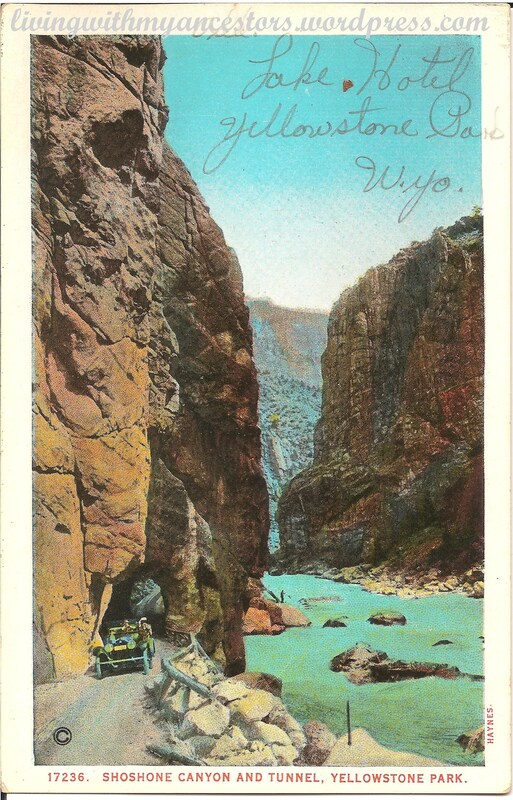 Shoshone Canyon and Tunnel. 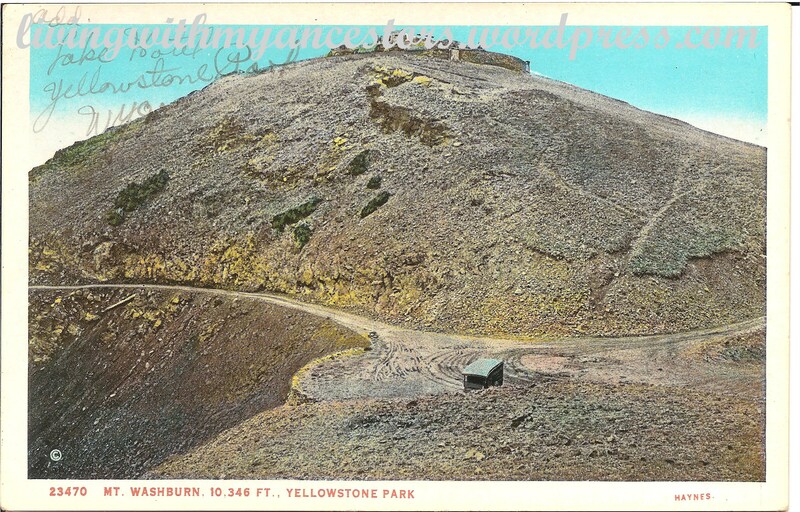 Several tunnels through solid volcanic rock were drilled in building the scenic highway from Cody, Wyoming to the Eastern boundary of the park, which is one of the most popular routes to the Yellowstone. Today: The (Buffalo Bill) dam was part of the Shoshone Project, which comprised a system of tunnels, canals, diversion dams, and Buffalo Bill Reservoir. Today, the project irrigates more than 93,000 acres, where principal crops are beans, alfalfa, oats, barley, and sugar beets. Although the number of irrigated acres never reached the 150,000 acres originally projected by project proponents, the figure has increased steadily over the years: from 25,753 acres in 1915 to 41,331 acres in 1928 to 77,560 acres in 1953. Cleopatra Terrace, Yellowstone Park, is one o the large group of travertine, (calcium carbonate), formations at Mammoth Hot Springs over which the hot water trickles, building beautiful successions of ledges colored with delicate shades of brown and yellow by low forms of plant life called algae. Today: Due to confusion related to the intermittent nature of many of the springs in the Mammoth Area, the name Cleopatra Spring has been given to at least three different springs over the years. As the confusion developed the original Cleopatra Spring came to be called Minerva Spring. 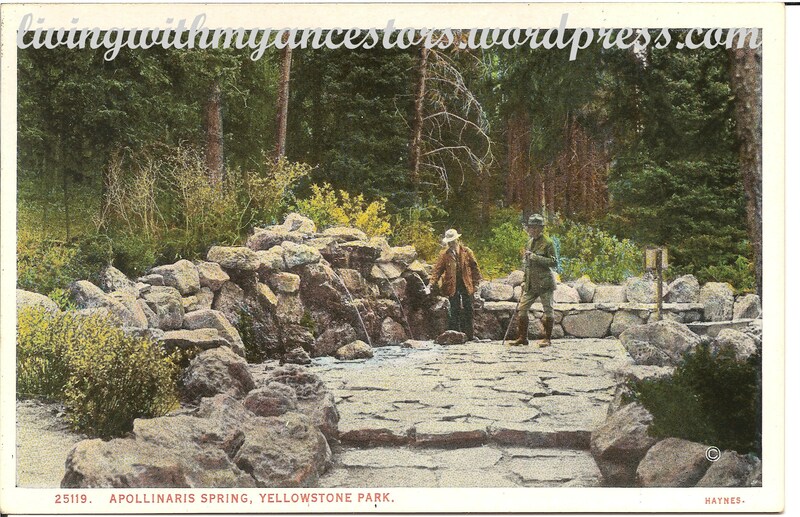 Apollinaris Spring, Yellowstone Park, became so popular with the greatly increasing patronage of the park that the paths and the natural well were replaced in 1925 by a stone structure, areaway and fountains for the added conveniences of the thousands who come to be refreshed. Today: Apollinaris Spring, located on Yellowstone National Park’s Grand Loop Road about five miles south of Indian Creek campground and 2½ miles north of Obsidian Cliff, is a cold, mineral water spring that was a stopping place for thirsty Yellowstone travelers for about 100 years. Mt. 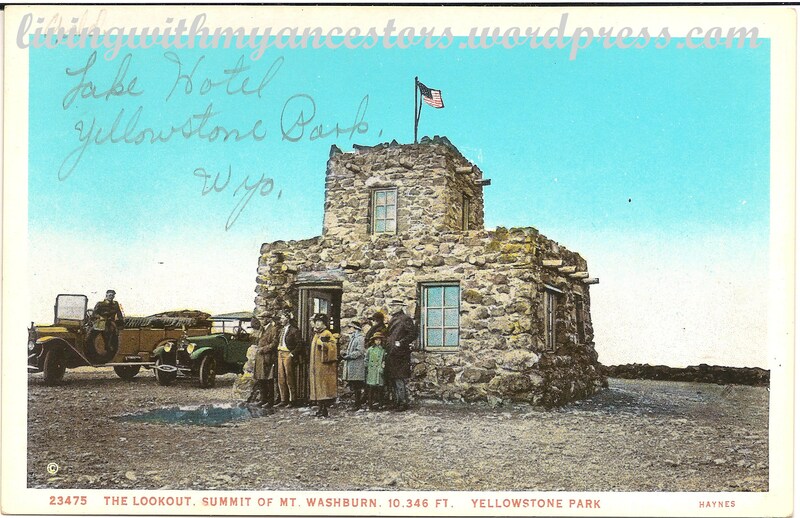 Washburn, 10,346 ft., Yellowstone Park, was named for H. D. Washburn, leader of the exploring party of 1870 and Surveyor General of Montana. The trip to the summit of the promontory is well worth taking. Today: If you can accomplish only one hike in Yellowstone, this is the hike. 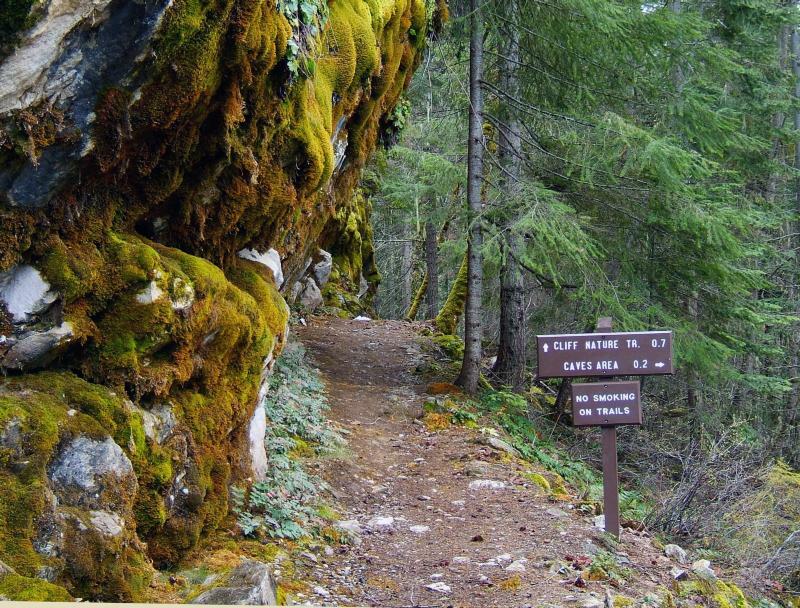 No other single trail provides as much in the way of scenery, wildflowers and wildlife as the Mount Washburn Trail. This also is one of the best evening or sunset hikes, but the drawback is that the return is in the dark. 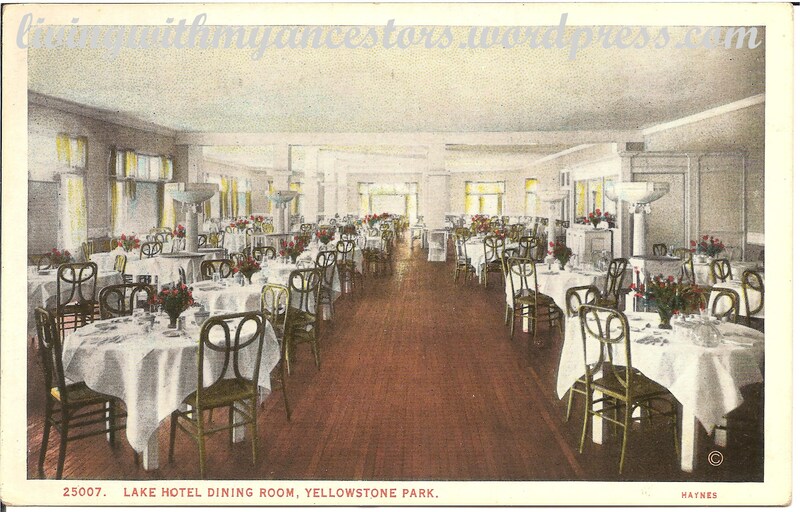 Lake Hotel Dining Room, Yellowstone Park, is an indication of the facilities provided for patrons of the Yellowstone Park hotels which are comparable to the large city hostelries, although many miles from the nearest city of railroad. From this room a splendid view of Yellowstone Lake is to be had. Today: The Lake Yellowstone Hotel Dining Room offers tempting preparations for breakfast, lunch and dinner. Our new fresh fish dinner entrées include wild Alaska Halibut and Salmon. Unique specialty sandwiches and entrée salads are offered at lunch. Treat yourself to the Portabella Melt for breakfast! 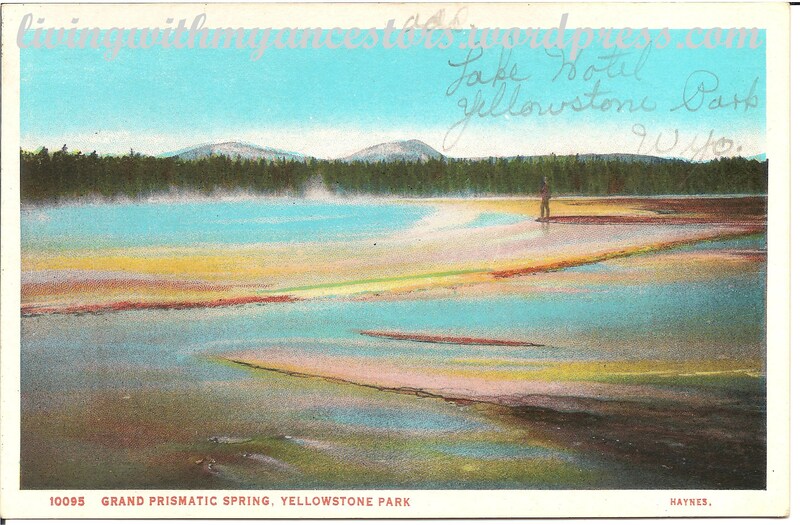 In a sort of continuation of my Dad’s west coast adventures, I have quite a few old postcards from Yellowstone. It appears that he was good at buying postcards and actually writing messages on them, addressing them, and then not sending them! All of the postcards in my possession contain no stamp or postal cancellation. So, I must assume that he just brought the cards back to Kentucky when he returned. I do hope he did manage to send other cards to all these people. After all, he was asking them to write! If you’re just joining us here, please feel free to visit the two previous posts leading up to this one. For the beginning of the story, click here to open Riding the Rails During the Great Depression, and click here to open Dad’s Tour of the West Coast During the Great Depression. Each link will open in a new tab. Twin Cub Bears, Yellowstone Park. 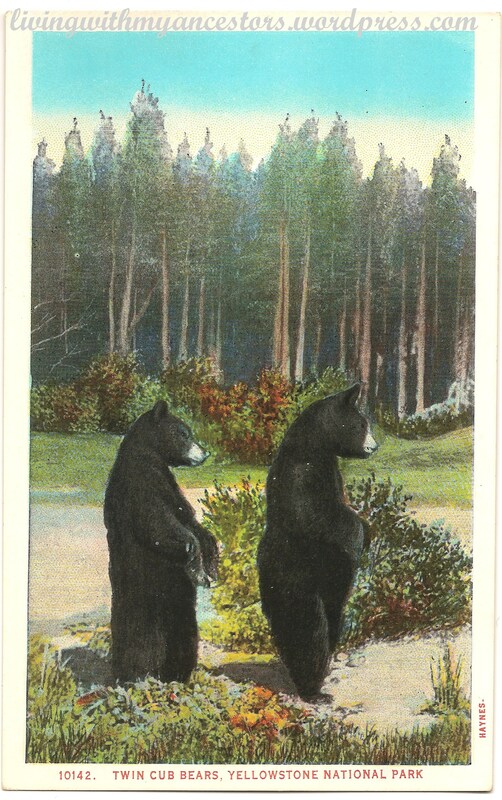 The black bear exists in the park in a number of color phases, the commonest type is black with a brown nose. Others are dark and medium brown, reddish brown and dull buffy brown. Even cub bears resent being teased and are usually treated with the respect that they deserve. Today: The Grizzly bear population within the Greater Yellowstone Ecosystem is estimated to be approximately 600 bears (Haroldson and Frey 2011) bears. Approximately 150-200 of these grizzly bears are estimated to have home ranges at least partially inside Yellowstone National Park. There are no current scientific estimates of the black bear population in the Greater Yellowstone Ecosystem, however black bears are considered to be common in the area. Petrified Tree, Yellowstone Park. This remnant of a great primeval forest turned to stone through the ages has to be protected from unthinking souvenir hunters by a jail, however, a good view may be had of it despite the barriers. Nearby, though leveled to the ground within the past decade, is a buried stump nearly six feet in diameter. Today: (It’s still there!) 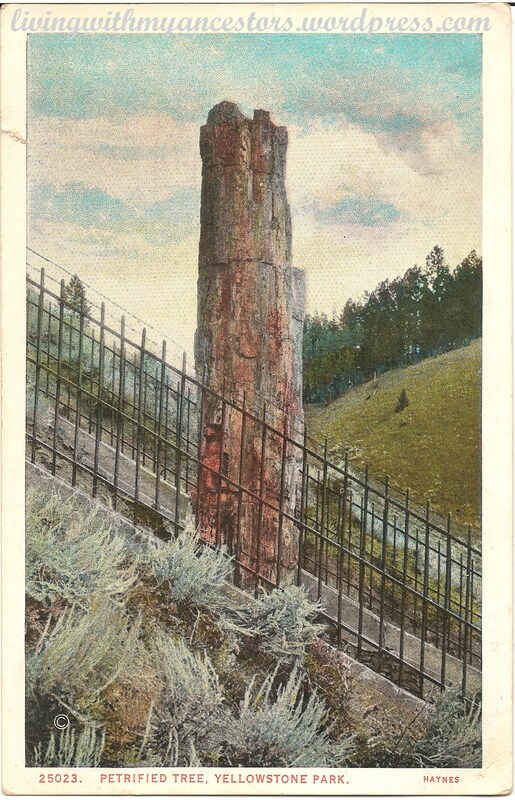 The Petrified Tree, located near the Lost Lake trailhead, is an excellent example of an ancient redwood, similar to many found on Specimen Ridge, that is easily accessible to park visitors. The interpretive message here also applies to those trees found on Specimen Ridge. 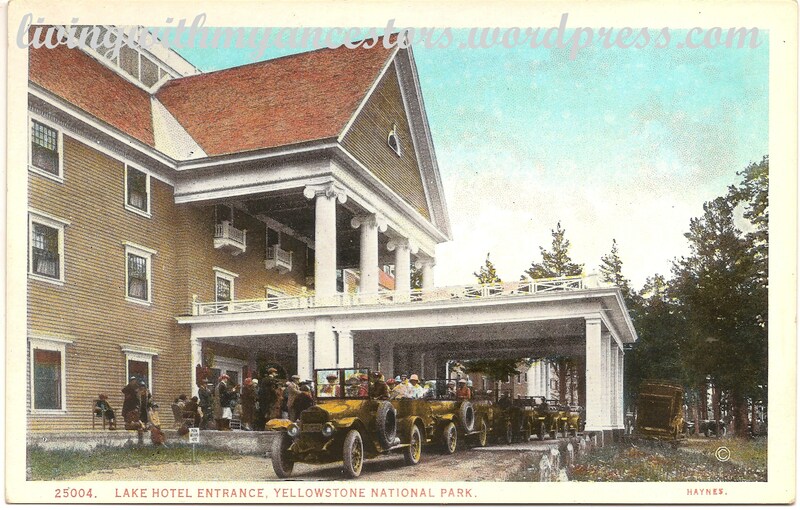 Lake Hotel, Yellowstone Park, is one of the four large hotels operated in the park by the Yellowstone Park Hotel Company. It overlooks Yellowstone Lake, the largest body of water in the park, which has an area of 139 square miles and is at an elevation of 7,730 feet above sea level. He worked at this hotel. Today: Still there and operating! Lake Yellowstone Hotel is undergoing a full interior multi-million dollar renovation including lobbies and public spaces, restaurant, bar and guest rooms. The work will be done in two phases. Phase 1 will be completed in June 2013 and includes 45 guest rooms, dining room, lobby and front desk area. Phase 2 will begin by 2015 and will involve all remaining rooms, the Lake Deli and public spaces. This historic hotel, originally built in 1891, has been listed on the National Register of Historic Places since 1991. The elegant structure, known for its Colonial architectural influence, yellow exterior color and huge white columns, will benefit from a major structural stabilization as part of the early renovations. The interior features a massive Sunroom lobby overlooking Yellowstone Lake and a lake view dining room. 45 guest rooms will be involved in the first phase of renovations and will now include in-room wired internet availability. Other interior improvements will be the addition of a business center with computer stations and wired internet for Lake Hotel guests, and a redesigned lobby bar that will serve Sunroom and dining room guests. 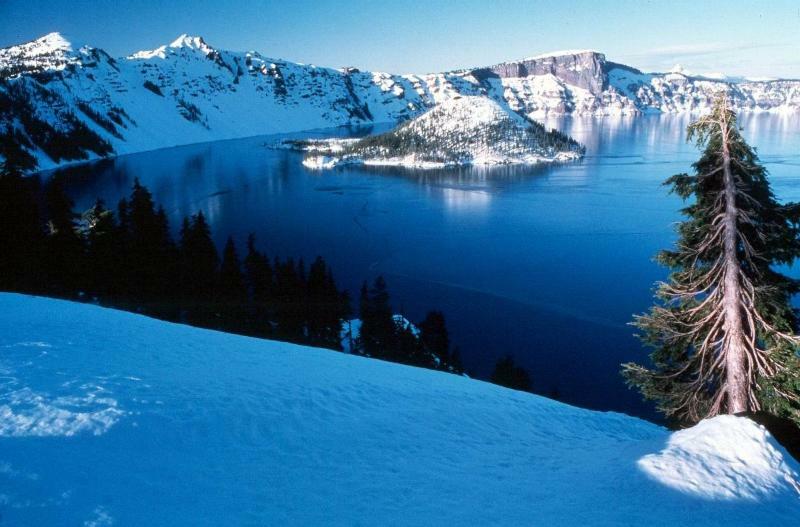 For 2013, Lake Yellowstone Hotel is accepting reservations for renovated and non-renovated guest rooms. Non-renovated rooms do not include the amenities, including internet, associated with the newly renovated rooms. The Lookout, summit of Mt. 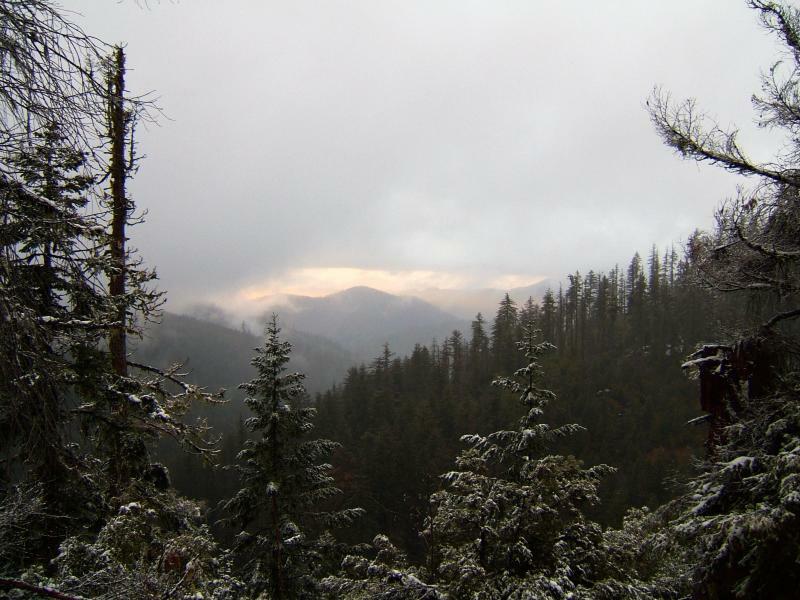 Washburn, 10,346 ft., was built by the National Park Service as a fire lookout, and resting place for guests. From here the majestic Teton Mountains, many miles away are visible, as well as a good panorama of the entire park. Today: Still there and still functioning. The link takes you to a more current photo (1997). Mt. Washburn is the only lookout accessible by vehicle. Grand Prismatic Spring, near the crater of the now extinct Excelsior Geyser in the Midway Geyser Basin is considered one of the most beautiful hot pools in the region. It is always quiescent, and steaming. Today: Grand Prismatic Spring, located in Midway Geyser Basin, has the distinction of being the park’s largest hot spring. It measures approximately 370 feet (112.8 m) in diameter and is over 121 feet (37 m) deep. A description of this spring by fur trapper Osborne Russell in 1839 also makes it the earliest described thermal feature in Yellowstone that is definitely identifiable. 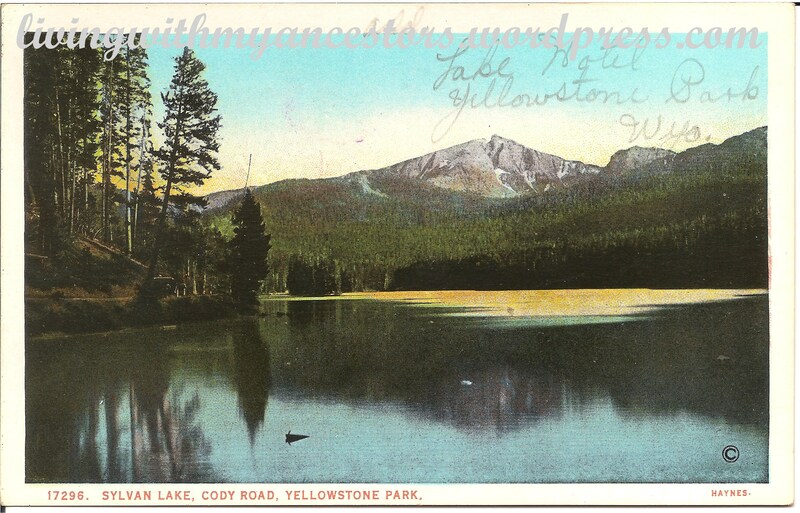 Sylvan Lake and Top Notch Peak, Yellowstone Park. Sylvan Lake is at an elevation of 8,413 feet, while a short distance to the East is Sylvan Pass, 8,559 feet high. 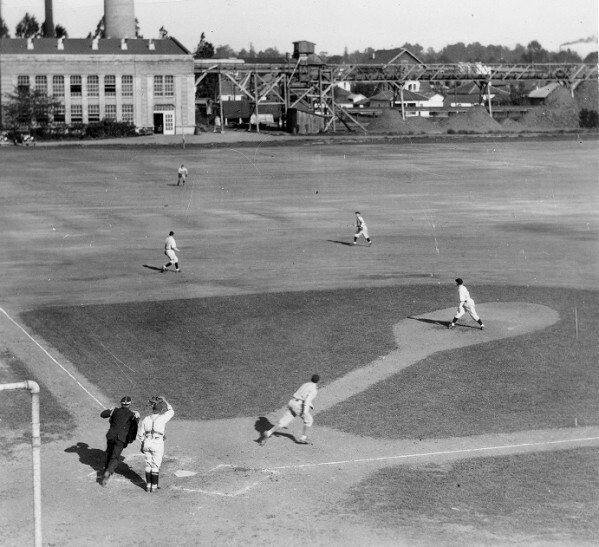 This picture is one of the most popular of the entire Haynes’ collection of the park. Today: Cutthroat trout are native to Sylvan Lake. Between 1913 and 1943, however, an additional stock of over 2.5 million fry was added to the lake. In 1978, longnose suckers were discovered in the lake, likely having found their way there from Yellowstone Lake via Clear Creek. Today, fishing for cutthroats is catch and release only. In Yellowstone Park there are approximately 1000 buffaloes (American Bison). The majority of these constitute the Lamar Valley herd., some of which are in this picture. 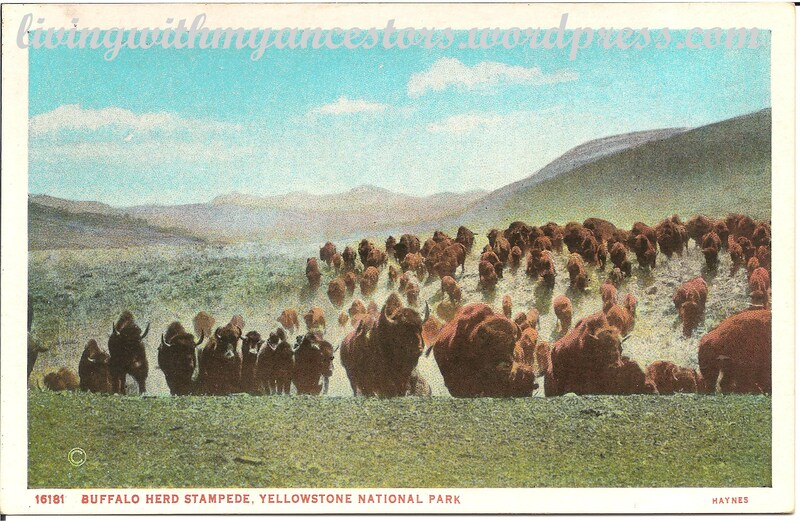 The “show herd” of only a few buffaloes is quartered at Mammoth Hot Springs during the summer season. Today: The bison (Bison bison) is the largest land mammal in North America. In a typical year, more than 3,000 bison roam the grasslands of Yellowstone National Park. Bulls are more massive in appearance than cows, and more bearded. For their size, bison are agile and quick, capable of speeds in excess of 30 mph. Each year, bison injure park visitors who approach too closely. 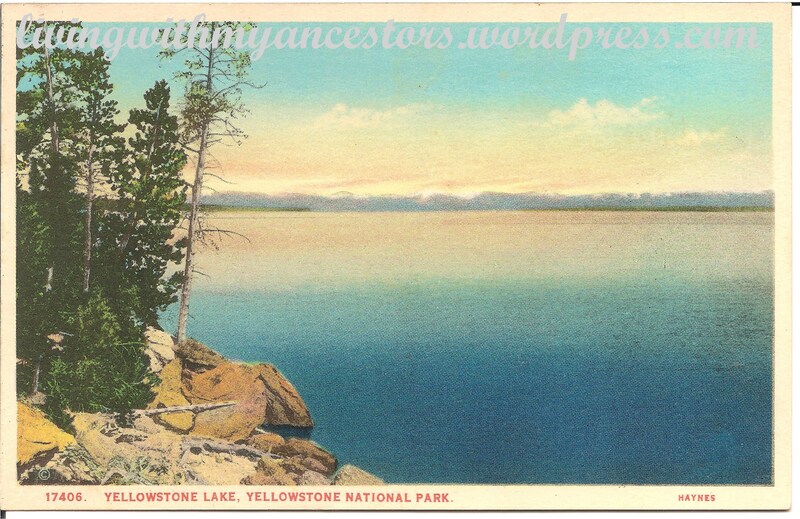 Yellowstone Lake, elevation 7,734 feet, has an irregular shore line of 100 miles, twenty miles across, and is fed by springs and glaciers of the mountains surrounding it. Its waters are cold, clear, and swarm with native trout. Today: Recent research by Dr. Val Klump of the Center for Great Lakes Research and the University of Wisconsin has revolutionized the way we look at Yellowstone Lake. Figuratively, if one could pour all the water out of Yellowstone Lake, what would be found on the bottom is similar to what is found on land in Yellowstone; geysers, hot springs, and deep canyons. With a small submersible robot, the researchers found a canyon just east of Stevenson Island which was 390 ft. deep. Prior to this finding, the deepest spot in the lake was thought to be 320 ft., at West Thumb. Roosevelt Lodge in Lost Creek Canyon, overlooks the Lamar River and Yellowstone River Valleys. Near here President Roosevelt camped for a month in 1903. The surrounding country provides countless interesting nature studies. 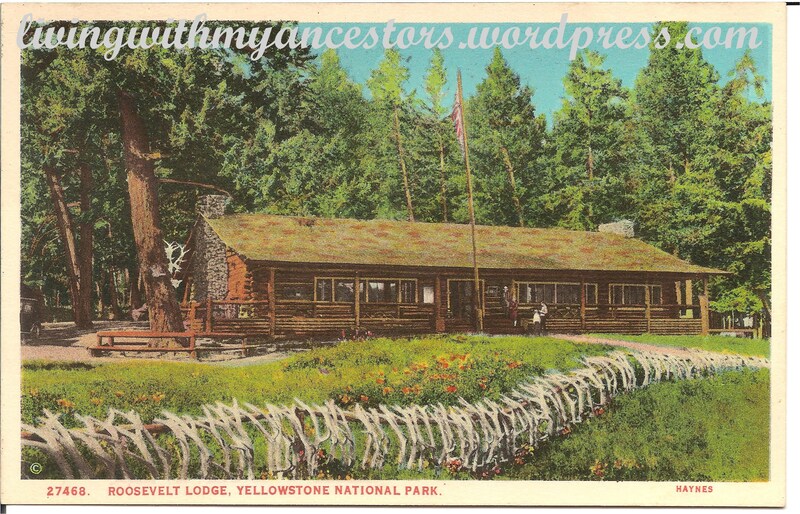 Today: Named for Yellowstone enthusiast Theodore Roosevelt who regularly visited the park, this rustic log lodge and cabin facility was built in an area of the park that was a favorite of Theodore Roosevelt. Crater of Mud Volcano, Yellowstone Park, a paint pot about thirty feet in size emitting frequent bursts of steam; but since 1898 has had no violent eruption. In 1870 N.P. 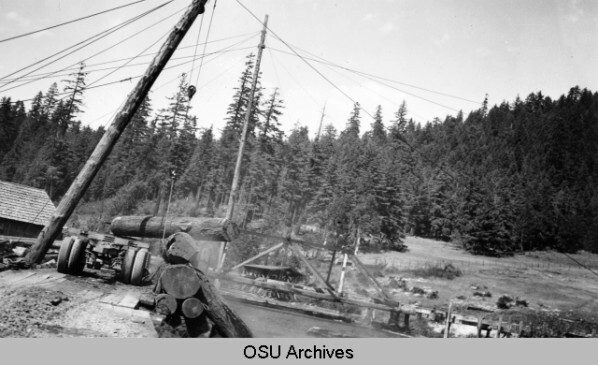 Langford witnessed an eruption of the Mud Volcano which attained a height of several hundred feet. 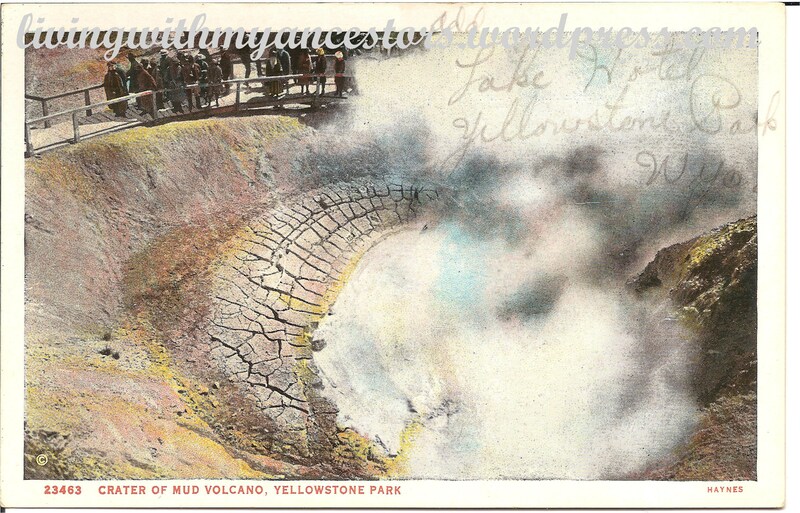 Today: When the Washburn Expedition explored the area in 1870, Nathaniel Langford described Mud Volcano as “greatest marvel we have yet met with.” Although the Mud Volcano can no longer be heard from a mile away nor does it throw mud from its massive crater, the area is still eerily intriguing. 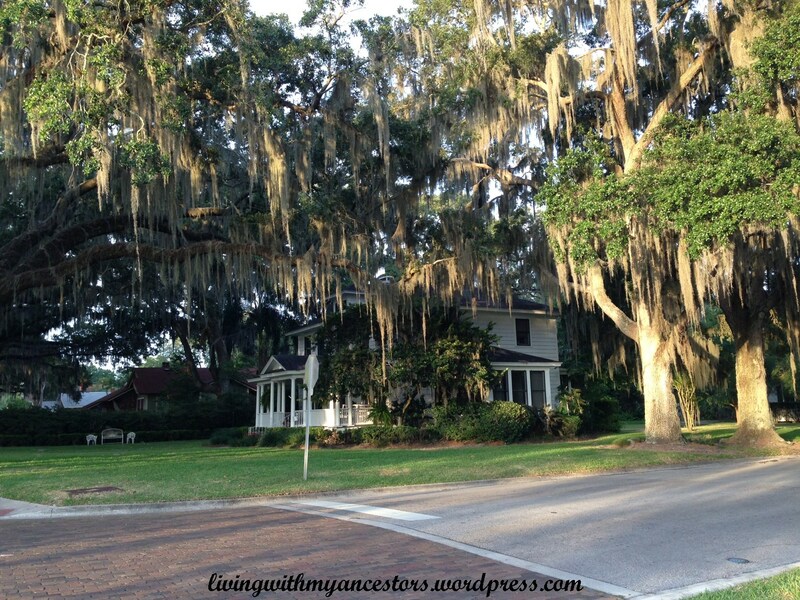 I would like to thank Martha at homethoughtsfromabroad626 for nominating me for The LIEBSTER Award! It is an award for bloggers who have fewer than 200 followers and it helps to highlight and promote new blogs. So, thank you, Martha! 1. Post the Award on my blog. 2. Thank the blogger who gave me the Award and link back to their site. 4. Answer 11 questions that the presenter of the Award has asked. 5. Nominate 11 new bloggers with fewer than 200 followers who I want to receive the Award. 6. Ask my nominees 11 questions of my own. 1. 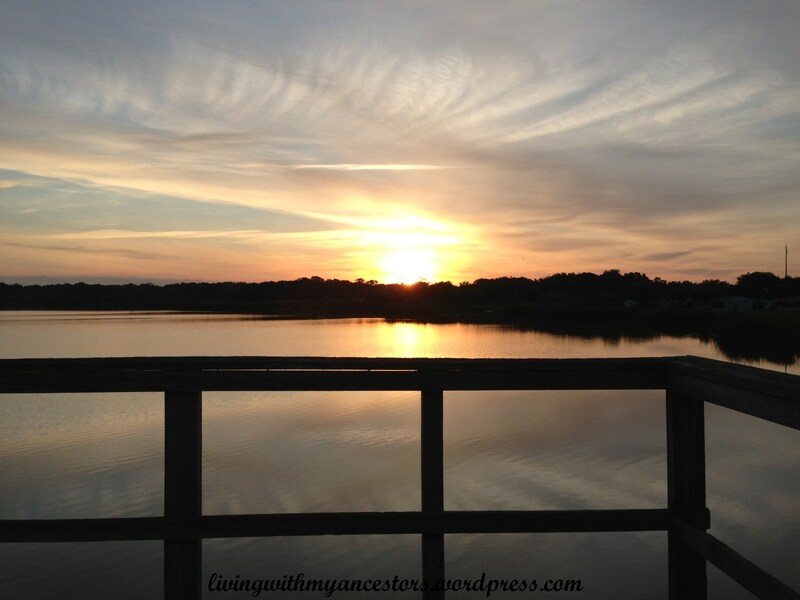 I love researching my genealogy, reading, writing, crocheting and animal care. 2. I am trying to incorporate a healthier way of eating into my lifestyle. 3. Mystery and detective novels are my favorite reading (or listening to mp3 in the car). I also read a boatload of books on crafts and the art of writing being hopelessly optimistic something will sink in and really make a difference. 4. I no longer have cable TV but I still have a number of favorite shows that I watch, both old and new, through streaming. 5. I love what little I know about IRELAND and hope to visit there one day. 6. I was a secretary, primarily in the legal field, for about 35 years. 7. I have worked as a police officer and a veterinary assistant, just not at the same time! 8. 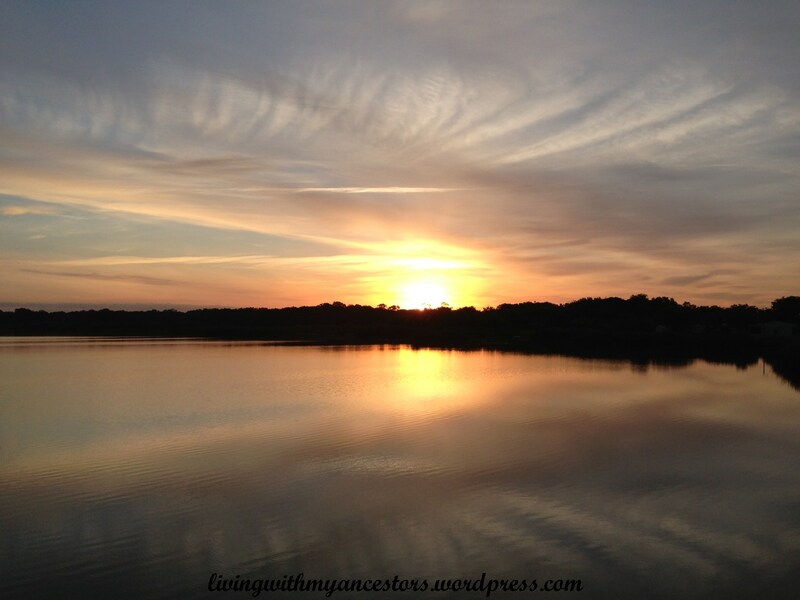 I am an amateur genealogist and would love to be an amateur photographer. 9. I love vintage, antique, retro movies, furniture, clothes! 10. I currently have two dogs and five cats, all rescues. 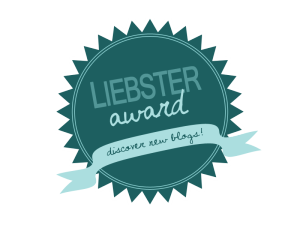 I would like to nominate the following eleven blogs for the LIEBSTER Award because I enjoy their posts. Each blog has less than 200 followers, and hopefully this Award will help promote more followers. So, don’t take my word for it. Go check them out for yourself! 6. Which was your most memorable birthday? The next one! 7. What was your favorite year and why? They’ve all been pretty good! 9. What did you do for the Millenium New Year’s Eve 1999/2000? Was glad I still had a functioning computer! 10. What is your greatest accomplishment? Still having a lot of the same friends for over 50 years. 1. If you could be an animal, what type of animal would you be? 5. Link to your favorite recipe? 6. Best place you have ever visited? 7. What was your favorite childhood tv or book character? 8. What is your most recent good deed? 9. If you could only take two things with you from your home, what would they be? 10. What is the most exciting thing that has ever happened to you? 11. If you could turn back time, what would that time be? Again, thanks to Martha for this nomination, and thanks also to those I have nominated for the interesting posts on your blogs! Back in January 2013, I made my first ever blog entry entitled Riding the Rails During the Great Depression. It was primarily excerpts from a short travel diary my father kept in 1931, during the depression, when he and a number of his buddies rode the rails from Ashland, KY to Washington State. If you have an interest in checking out the first part, you can click on the italicized title above and you should be taken there for a quick review. In this diary, he makes references to pictures taken with his camera. I’m afraid I don’t have any of those which is a major disappointment. When I last left off, the train had entered Portland, Oregon and he was talking about how beautiful everything was. I checked my things at the Y and caught a street car over to Vancouver. I met Mr. and Mrs. James and also got a square meal. 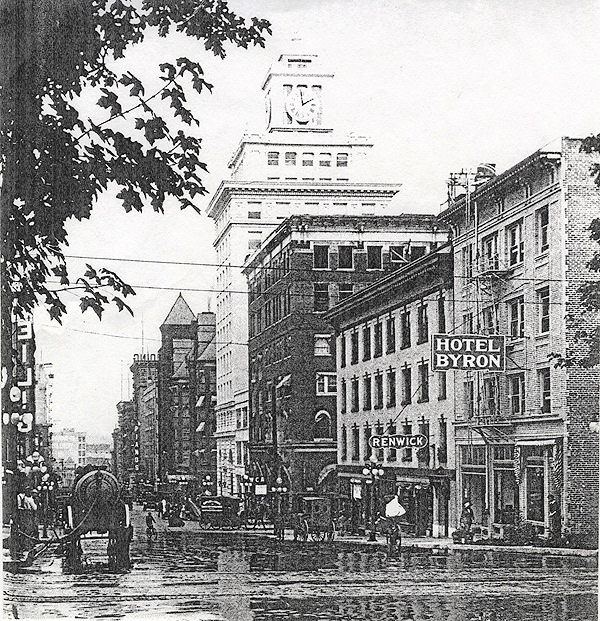 I came back over to Portland that afternoon and ate at the Y then I got a room in the Byron Hotel. I signed up for a week. I don’t know who Mr. and Mrs. James were. Probably family of some friends back in Ashland who were being hospitable to the out-of-towner. 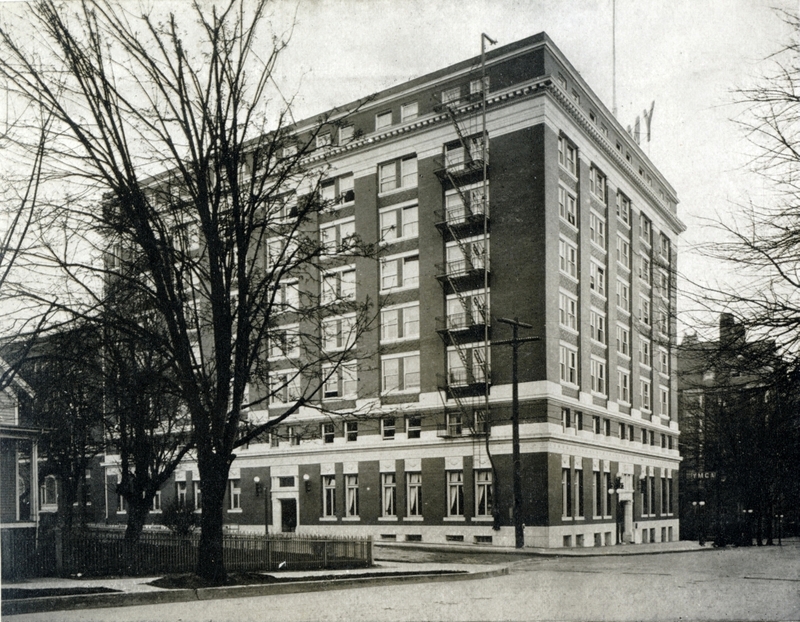 I read a little about the YMCA in Portland during that time period. The little bit I read, it seems that the Y didn’t have such a good reputation at that time and maybe that’s why he moved on to the Hotel. We took in the sights that nite and then got a good nite’s sleep. Six of us went to the Baptist Church the next morning to Sunday school. That evening Mr. O’Neal from Medford hunted us up and took Tussey, Elsworth, and myself for a ride. We also played a round of Golf. The Oregon O’Neals were related to an O’Neal family in Ashland that Dad and his friends knew and they had agreed to host them. I never knew that Dad had ever had any interest in golf, let alone that he played the game when he was young. Sunday nite was spent taking in the sights again. Monday was also spent in seeing the sights and we left Portland at 6:00 o’clock Monday p.m. headed south. We ate a swell supper in Salem (the State capital). That nite we stayed in a tourist cabin. We were on the road again at 5:00 headed for a little place called Detroit. The fellow told us that he would have plenty of work for us if we would wait 10 days. We didn’t want to wait. Left at Mill City a Mr. Allen showed us through a big lumber mill, it sure was a big one too. I believe I’d rather work in the steel mill. As I read through his diary and noted references to little bits and pieces of information, it seems that his trip out West was not just a “vacation” and to see the sights. It is becoming more apparent to me that he and his buddies went West looking for work. Perhaps the only kind of work available during the depression in Kentucky and the surrounding area might have been at one of the steel mills. I can’t imagine how hard that kind of work would have been. It sounds like he maybe checked out the steel mills before heading West and the lumber mills were giving him a new perspective! 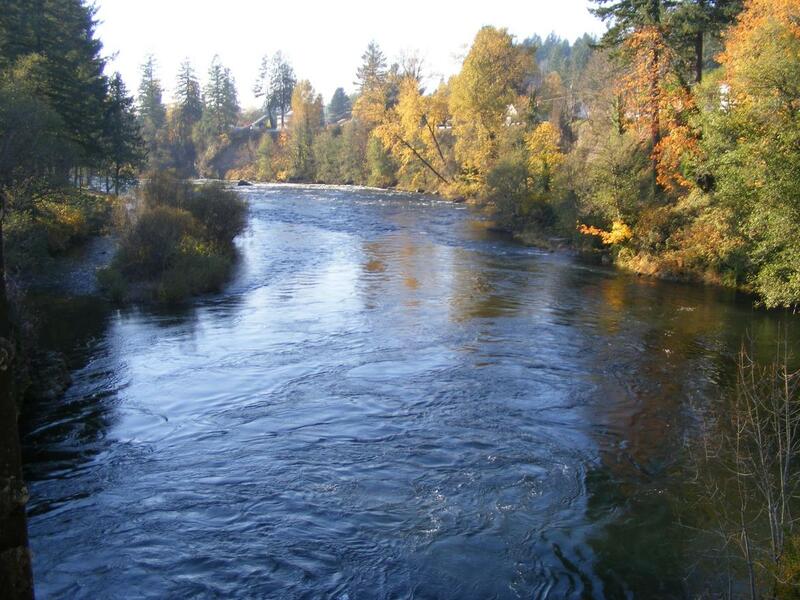 Mill City was on the Santiam River. I snapped a couple of pictures of the river. Our next stop was at a lumber camp on Lost Creek a branch of the Williamette[sic] about 100 miles from Mill City. I got a few pictures of the logs there. We then came back to Eugene. The site of the Univ. of Ore. I stayed that nite at a ranch at Creswell, 12 miles from Eugene. We shot the bow & arrow and I accidently won it. I hit the bullseye out of my first 6 shots. The next morning we went to a construction camp on the Williamette[sic] River, about 80 miles from the Camp. I snapped a few pictures there too. That afternoon we played a game of Golf in Eugene then we saw the Univ. of Ore. Beat the Univ. of Idaho 17 to 0 in a baseball game. Mr. O’Neal asked us if we wanted the car to go to the dance that night. Of course we did so we shaved, washed and cleaned up and were off. I had to talk a long time before he would let us in free. They don’t dance like we do back home so we didn’t have much fun. I tried to dance with some dame that said her name was Sybil Cornutt but it was a flop. After the dance we passed them walking down the street. They were plenty willing to take a ride and so were we. And did we have fun. We arrived home at 3 bells. Dame? He said dame? It must have been the times. Maybe they got that from all the movies or gangster quotes like from Al Capone! You know, the Al Capone they couldn’t find listed in the phone directory when their train stopped in Chicago! Anyway, I was curious about this Sybil Cornutt. Other than Dad’s buddies, it was the only name he wrote. So, curious cat that I am, I did some Googling. I had hoped to find a picture or something to make her come more to life. I did find her on a couple of genealogy sites and suffice it to say that Sybil Cornutt was born in Oregon on September 16, 1910. Same year Dad was born! It fits. After a 3 hour rest we were on the road to Medford. We picked up Paul Vaughan and Chas. Ball, 2 of the gang. 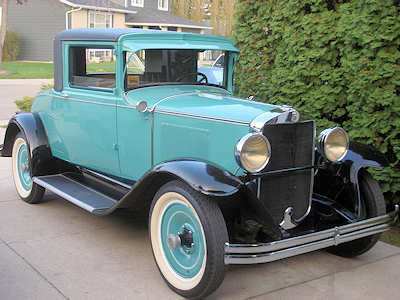 They said they were going to Tulsa, Okla.
Sam and I stayed that nite at Mr. O’Neal’s in Medford and again we got the car. The next day we took a trip to the Ore. Caves, 4500 ft upon a mountain. It sure was a beautiful trip. Sam and I went to a show to-nite. 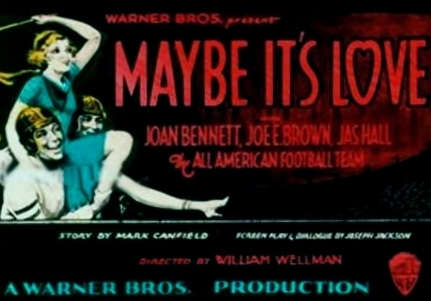 We saw Joe E. Brown in “Maybe It’s Love” and it sure was good. This morning, Sat. May 2, we were up bright and early and off for a trip to Crater Lake. The sun is shining bright in the Valley, but there’s clouds around the top of the mts. As we go up the Mt. we run into rain and it begins to get cooler. As we continue to climb, we hit patches of snow and then nothing but snow. As we near the top of the Mt. where the lake is, the rain turns into snow and it sure is cold. There is about 10 ft. of snow on top of the Mt. 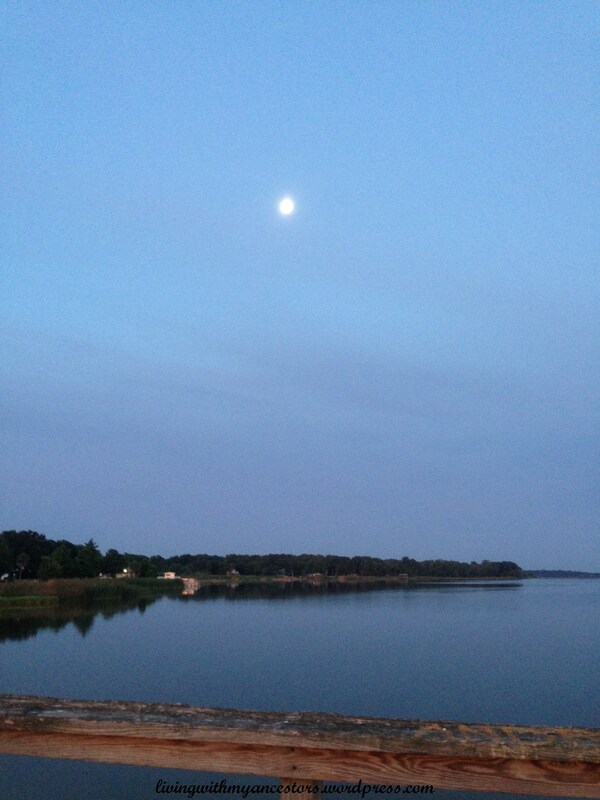 and the lake sure is beautiful. It’s cloudy though and I’m afraid my pictures won’t be very good. The lake is about 20 miles across but it doesn’t look 2. As we come back down the Mt. the snow turns to rain and then into sunshine and back into warm weather again. It hasn’t even rained a drop in the Valley. Sun. 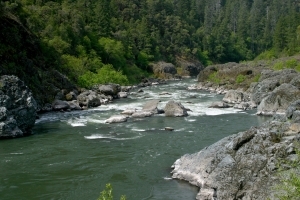 morning we took a fishing trip up in the Canyons of the Rogue River. I turned out to be a poor fisherman but I did hold my own with the rifle. I wonder what he meant by a “poor fisherman”? Because, as he got older and was looking forward to retirement (before he lost his health), he used to always say he wanted to spend his retirement fishing. So, maybe he just meant that he was a poor fisherman that day because he didn’t catch anything. We had ice cream and cake for supper. Mmm, sounds like my kind of eatin’!! This morning, Mon. 4th, I walked about a mile to a gasoline station to see about a job but I was too late. He had just hired a fellow. Well at 2 o’clock this afternoon I took a notion I wanted to go to Santa Barbara, Calif. So I shipped 2 shirts, my bathing suit and some toilet articles on ahead and lit out with only my camera. 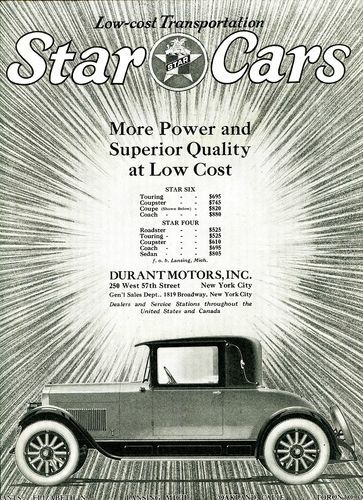 My first ride was with a fellow in a Star Coupe. He said he was going 75 miles down the trail. I only rode 13 with him cause I didn’t like his looks. I got out in a place called Ashland. They had the State Normal School there and plenty of fun women. My next ride was in a Paige Coupe for about 200 miles to a place called Redding, it is in Calif. It is so damn hot here that I’m about to croak. The bed is clean but as hard as a rock. So good nite until tomorrow. Well, that’s the end of Dad’s writings about his trip. Sigh… It’s not the end of his trip, though. I do know he had an uncle living in Santa Barbara. I have bits and pieces of information from here and there about his summer in the West. I thought at first this was just a trip to the west coast to do some sightseeing and then return home again. Suffice it to say, I’ve been surprised. I haven’t calculated how much time was spent but with travel and various jobs, it was definitely months! So I’ve got my work cut out to try and put it all together. So, on that note, in my Dad’s words, good nite until tomorrow (the next time)!